I am currently undergoing Physical Therapy for just this reason. My posture and lower back are out of sync and need support. So when I was approached by this company to test out their back support system I was more than happy to agree. At first look, it looks like a jumbled up mess of velcro and straps. Once I figured out how to put it on and adjust it, it kind of felt like I was putting on a backpack. Instantly I felt my shoulders pull back to where they needed to be, and my thoracic spine align. It was quite uncomfortable at first, mainly due to the fact that I dont hold myself that way. 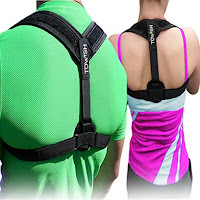 REVENTION IS BETTER THAN CURE Our sedentary lifestyle can take a toll on our posture, luckily, bad posture can be corrected over time by using support braces and posture correctors. ✔️bad posture✔️clavicle fracture✔️Thoracic kyphosis✔️forward head carriage✔️slouching✔️hunchback✔️Osteoporosis pain✔️Misaligned spine ✔️sports injuries and generally, all affections where your physician prescribed a Figure 8 brace. ✅Perfect Golf and bowling equipment and accesories! ✅Affordable and comfortable to wear under or over clothes! We make customer satisfaction a top priority! Enjoy the peace of mind to buy directly from the manufacturer!